Abstract: Pipetting of solutions is a common practice in chemical and biological laboratories. Many core types of chemical analyses are based upon analytical techniques involving accurate delivery of liquid components. A common tool developed to deliver these liquid components is the handheld micropipette, as well as automated versions of the same. Handheld and automated pipettors have become commonplace tools, especially used in many biological and pharmaceutical laboratories. While these tools are familiar to many, their performance differences when pipetting different types of solutions are often overlooked and neglected aspects that relate directly to the accuracy and reproducibility of pipetting performance. For example, it is commonly known that water pipettes differently than serum. This presentation will address the difference in performance of a handheld micropipette when dispensing water versus various types of animal and human serum. These differences are quantifiable and can be accounted for through careful experimentation and attention to physical pipetting details. 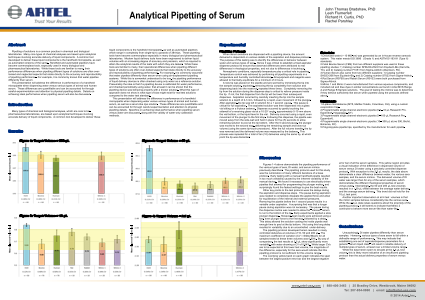 Details on achieving ideal performance when pipetting serum will also be discussed.